It has been very, very dry in California of late. So much so, that California is in a state of emergency from drought. Happily, it has been raining, but not so much as to cure the drought overnight. A small, personal downside to the lack of rain has been a shortage of dramatic skies and lush green hills. ISO 160, f/8, 5 RAW HDR: 1/2000s, 1/1000s, 1/500s, 1/250s, 1/125s. I had gone out with my new tripod (see below) to test it out. I had intended to do a timelapse of the clouds, however I did start with a series of bracketed exposures before proceeding with the timelapse. Getting back home, I looked at the five bracketed photos and saw they were a overwhelmingly gray and lacked punch (I didn't stay until sunset, I had other arrangements at the time). So I did something I rarely ever do: I increased the saturation in addition to the vibrance. I made no changes to white balance, as I set that to cloudy while in camera. Then I sent the five photos into Photomatix for processing. I then took the Photomatix output into Pixelmator and remixed it with the +1 exposure. I blended the foreground, Lighthouse and tree into the dramatic sky that Photomatix gave me. I then applied a Gaussian blur and darkened the sky with an overlay layer setting. Then I sought to add some light streaks from between the clouds and sun with a zoom blur and blended that in. 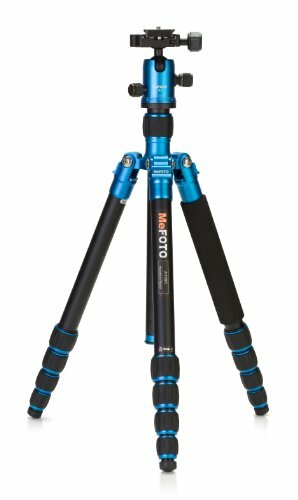 I just received my new tripod: a MeFoto Roadtrip in blue! I found it to be very sturdy except for the last section of legs, which seem fragile. It's much taller than I thought: with the center column up, it comes to eye level for me and I'm 5'11". In most of the reviews of the MeFoto, hardly anyone mentioned that center column is reversible for some low to the ground shots or macro photography. I found the twist locks for the leg extensions to be very easy to unlock and the weight of the leg sections extend just by gravity. The opposite of that is to just flip the tripod upside down and the leg sections collapse back.